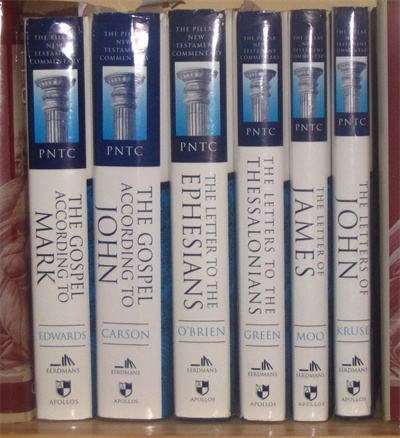 The Pillar commentary series has been slowly but surely growing for well around 20 years now, with thirteen published volumes, and authors assigned for all the remaining ones. In fact, it would appear that some of the earliest volumes are already in line for replacement. The target audience seems to be pastors and undergraduate level students of the Bible. The way that the exegetical options are discussed and current academic theories are interacted with will put it out of reach of the casual Christian reader, but they are not designed to compete with the technical and exhaustive commentaries. The series falls firmly within the conservative evangelical tradition, but draws commentators from a variety of church backgrounds. The series editor is Don Carson, who supplied the Gospel of John and is also rumoured to be working on Revelation and Galatians in this series. He seems an ideal candidate for the editorship. Not only is he known for his exegetical prowess and engaging style of writing, but he is something of a commentary connoisseur, having written a review of New Testament commentaries that is now in its fifth edition. It comes as no surprise then, that he is assembling his very own “dream team” of commentators (notably O’Brien and Moo who have written two each) and apparently making an effort to plug some significant gaps in the evangelical commentary market. The commentary itself is based on the NIV text (TNIV in some of the newer volumes), but the writers show no particular loyalty to its wording, often preferring to offer a completely different translation on which to comment. The biblical text is included in most, but not all the commentaries. Greek vocabulary and verb tenses are regularly discussed, but the Greek is always transliterated and translated (though sometimes in Greek script in the footnotes). Recent volumes in particular have shown a greater interest in quoting ancient sources than interacting with multiple modern commentators, although there is a willingness to take on major proponents of opposing views where necessary. Footnotes direct the reader to further reading where appropriate and are sometimes used for more detailed grammatical analysis. The commentators are prepared to discuss variant readings, and even reject traditional interpretations but will not criticise the meaning of the text itself, treating it as God’s revealed word. The introductions are usually fairly lengthy (50-100 pages) and it is here that the liberal tendency to reject traditional authorship, historicity and typical reformed interpretation is called into question. However, the authors are usually content to simply show the plausibility of traditional options rather than considering themselves to have ‘proved’ anything about dating, authorship, and structure. To keep the comments on any particular verse from becoming unmanageably long, extended discussions are often moved into excursuses. The length and frequency of these varies with author, but they usually add significant value to the commentary and allow greater theological reflection. The main focus of the commentaries is exegetical but with a view to aiding expositors. The meaning of each sentence is determined, and then it is shown how it fits in with the overall argument of the section and book. If there is an apparent discord with other New Testament passages, this will usually be discussed. The authors are free to make comments on the theological and practical implications of the verses for contemporary Christian life, but are never preachy. In most cases they prefer to let the text speak for itself. Where a verse has been used as a “proof-text” for a particular doctrinal position, the commentators will often mention whether they feel this to be justified or not, without entering wholesale into the debate. At least two volumes in the series (Carson on John and O’Brien on Ephesians) are widely acknowledged as the premier evangelical commentary on their respective books, and I expect more equally highly-acclaimed volumes will follow. The prices are unfortunately not as competitive as some other similar series (e.g. Baker Exegetical), but your money will not be wasted, and they are worthy additions to any Bible teacher’s library. I have reviewed a number from this series here on my site, and have so enjoyed the ones I have read that you can expect more to follow. Here’s the current list of volumes, with links to my reviews for the ones I have read. This entry was posted in Book Reviews, Commentaries and tagged PNTC by Mark Heath. Bookmark the permalink. I believe the count should be nine, not eight, though Philip E. Hughes on Revelation is no longer in print. It was made a part of this series along with Morris on Romans, Morris on Matthew, and Carson on John when Eerdmans decided to turn these independent commentaries into a series. I would also add Moo on James as the standard evangelical commentary on that book. The main competitors are the Anchor Bible volume by Luke Timothy Johnson, who is by no means an evangelical, and the NIGTC by Peter Davids, which is a good deal older and not as highly favored by most of the reviews I’ve read. I suppose you could consider Ralph Martin’s WBC, but that’s also older, and Martin is not conservative enough for me to be fully comfortable calling him an an evangelical. He considers himself one, but he doesn’t fit all standards for what the term means. I therefore think of Moo as the evangelical standard. I think you’re right on both counts. Moo on James is certainly worthy of the title, I just haven’t heard that many people recommend it. I found your blog by googling ‘life on wings ern baxter’. Thanks for making it available in MP3 format. I used to have the audio cassette but lost it years ago. Haven’t heard that masterpiece in over 25 years. It’s still as fresh and relevant today as it was back then. So I’ll be putting it onto my 14-year old son’s MP3 player! Is it posible to have some of your other Ern Baxter sermons in MP3 format? Please ‘mail me as I can’t find an email address for you anywhereon your blog.